A bit long of a post but try to read it fully to get a well rounded story. Alkaline or ionized water was all the rage some years back in the domestic water category. It hasn't lost it shine though. New and supposedly ever better models are still coming out and sales staff are still fervently promoting the benefits of drinking alkaline water. In fact, in c2011, I was approached by one company to write a book on the health benefits of alkaline water. Being somewhat skeptical then (and even more skeptical now), I respectfully decline. Then in c2013, another company approached me to conduct experiments to help substantiate the claims of its ionized water. This time, instead of talking about drinking the water itself, the company is interested in promoting the use of ionized water to preserve food, cooking and preparing beverages. It was convinced that food and beverages prepared as such were fresher, better tasting while retaining the benefits of drinking alkaline water. In this case, I must admit that the request was kind of outside my expertise so I happily pass it along to my food colleagues. So how is alkaline water produced anyway? It is typically produced in a machine commercially named a water ionizer. One part of the resultant water has above neutral pH (alkaline) of 8-11. (FYI, the pH scale ranges from 0 (highly acidic) to 14 (alkaline).) You can actually make alkaline water yourself (DIY) by adding sodium bicarbonate (just a fanciful chemical name for baking soda) into your water. But since the profit margins for selling baking soda are simply too low compared to selling a shiny and sophisticated machine like a water ionizer, no self respecting company will want to mention the possibility of DIY to make alkaline water. Back to the water ionizer... it makes use of electrolysis - passing an electrical current through water between 2 electrodes - 1 positively charged, 1 negatively charged. In simple terms, positively charged ions (cations) like calcium and magnesium migrate to the negatively charged electrode (cathode) while negatively charged ions (anions) like sulfate and chloride migrate to the positively charged electrode (anode). The cathodic region becomes alkaline due to reactions between the cations and water and no surprise, the anodic region becomes acidic due to reactions between anions and water. To further prevent the cations and anions from coming together again, ion selective membranes (a really thin film with special properties) separate the cathodic and anodic regions, allowing ions to pass only in 1 direction. In proper technical speak, the whole process should be called electrodialysis (because of the membrane) rather than electrolysis but I suppose electrolysis sounds easier to digest for most sales people and customers. Lots of water ionisers come with filters and other water treatment accessories e.g. activated carbon. To me, they complicate the issues regarding alkaline water. If you become healthier after drinking alkaline water, is it because of the alkalinity itself or is it because the water is cleaner after filtration? Nevertheless, I will focus on alkaline water per se in this post. You can find out more about water filters in my other posts. How does alkaline water benefit you? What a list! Don't get me wrong, there are indeed things that can improve many aspects of your health. Think of exercise for example. Exercise can do all of the above and more. It makes me wonder why some people are not doing it. Maybe they prefer to buy a quick fix like a water ionizer. After all, drinking ionized water does not come with the hassles of spending time and effort exercising and getting all sweaty and uncomfortable. Naturally, I am skeptical when a commercial product or service comes with more beneficial claims than snake oil. After all, how do you effectively prove so many claims. It is not easy to do scientifically robust studies to prove a single health claim. You need time to do that. For example, drugs can take years or more before they are allowed to be sold on the market. The gold standard will be clinical studies of patients involving double blind experiments. You don't see that with alkaline water (and lots of other health supplements). Yes, I know drugs are different from alkaline water but the health claims are no less serious and in many cases, alkaline water sounds more omnipotent than any drug. And in some cases, the suppliers use BIG words like "miracle" water. This really sets off the BIG warning alarms in my head and have me recoiling with BIG question marks. Eventually, what you often see are "testimonials" from "satisfied" customers. "After drinking alkaline water form XYZ brand, I feel healthier... I no longer suffer from health problem ABC... At first, I am unsure but after trying it out, I am a true believer." I bet you see roughly the same testimonials as above more often than you care to count. In a way, they are selling hope but what you don't want is when hope and reality don't meet. By now, I can hear some of you asking what does WHO say about pH in its drinking water guidelines. Well, in WHO 2011 edition, there is no recommendation for pH as it is not a health concern though Singapore's Environmental Public Health (EPH) regulations stipulate a pH of 6.5-9.5. I believe this range is more for protection of piping and equipment against corrosion in too acidic or alkaline an environment. Sometimes, scientific theories are presented out of context. Yes, acid and alkali neutralise each other. So if you body is too acidic (bad for health), simply drink some alkaline water to achieve balance again. Simple, right? If you believe that, maybe you also believe that you can remove your brain from you body and hook it up with wires and electrodes in a nutrient vat so that you can live beyond the demise of your body. (Just kidding) Unfortunately, our bodies are really complex machines. What works in a vat usually does not work in the real body with its many biochemical/biomechanical operations interacting in ways many times as yet not understood. Figure: An interesting and ultimately unanswerable question: "How do you know you are not a brain in a vat somewhere and your whole reality simply fed into your brain via electrochemical/biochemical signals?" Take pH for example. Human blood pH is an average of 7.4 (slightly above the neutral of 7). Drop below 7.35, you get acidosis. Go above 7.45, you get alkalosis. Both conditions can lead to serious health complications. The reason why human (and animal) blood needs to maintain such a stable pH is because pH is often quoted as the master parameter in any system, be it human body or a pond. It affects how chemical and biochemical reactions will play out. A different environmental pH will lead to a different reaction pathway, giving rise to different products. Or the reaction may not even proceed at all. So why are people talking about the body being too acidic? The body will automatically correct the blood pH within the narrow range of 7.35-7.45. (WE are talking about blood pH here. Saliva and urine will have a slightly different pH range. Stomach pH IS acidic - see below. Healthy fetal blood pH is also slightly different.) How in the world is alkaline water helpful? Lastly, if anyone reading this feels strongly about alkaline water being really vital for health, please do not flame me and just go ahead to drink it if it makes you feel better. This is after all a free society. As for me, I will keep alkaline water at a distance. More often than not, we just need an adequate dose of good old plain water to function efficiently at optimum health. Keep this a priority before you open your wallet to other "healthy" options. Figure: If you find yourself feeling lethargic, sometimes all you need is to hydrate yourself. 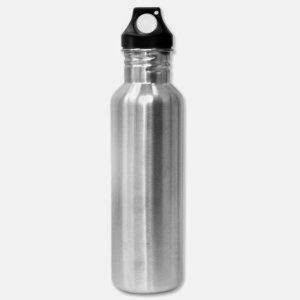 Above is my favourite type of water bottle - stainless steel. Tough, no chemicals to leach and possible to use it for boiling the water if necessary. Great article! I'm so glad to know more of the 'truth' behind alkaline water. Thanks! What you think about this study. Thank you for your article. Great logic and clear explanations. Thank you! Very logic.....I know baking soda can be use to make alkaline water too, but not sure how to explain the rest to other...now I just need is sharing this post! Thanks!! As a Chemist myself, I totally agree with what you are saying. A point not considered above is the condition of our kettles for boiling water. I have moved back from Hong Kong 2 years ago. I bought a completely steel kettle but with seams/joints at the base. Initially before I installed any filters, I noticed the base of kettle got slightly rusty ring in a space of a few months. The rust seems hard and cannot be easily cleaned off. (In HK I used a Panasonic alkaline ionising filter and never had that problem of rust set at its lowest alkaline setting.) I then installed a normal 4 stage reverse osmosis filter (not alkaline) and have been using it for a year now. The kettle rust did not improve but did not get significantly worse. Initially I thought perhaps the steel of this kettle is not as good as the one i had used i HK. So recently I switched to my clean old kettle from HK which has a completely steel kettle molded with no seams/joints at the base. My clean old kettle got rusty at the base within a month. The rust currently is not hard and can be cleaned off with a kitchen towel tissue. Hence I am concerned. I am now trying to figure out if it the water in Singapore or the 4 stage filtered water or the alkalinity that can help prevent rusty kettles. Without having more data, I would say it is hard to pinpoint one factor or another. The best way to find out is to do experiments using tap water (HK vs. SG), kettle (old vs. new), filter (old vs. new) but this is probably quite impractical. We should at least know more about the HK vs. SG properties in tap water: pH, iron content (this gives rise to rust in the right conditions), ORP (oxidation reduction potential) and possibly other parameters e.g. conductivity, temperature to make a reasonable conclusion on how the rust is formed. Great article. :) So actually we should instead be looking at filtered water, instead of alkaline water? I use alkaline water. Any idea how the body produces substance to neutralise the acidity in the body. As we age, will we run out of that substance? Is that substance essential for our old age to maintain health? Could alkaline water helps put body to neutralise the acidity so that the substance in our body is used much lesser? Thank. As can be expected, the way our bodies handle acidity and alkalinity is pretty complex. In simple terms, our bodies can only function effectively within a narrow pH range though different parts of our bodies can have different ranges. First, blood itself is about pH 7.4. Blood is also a buffer, meaning that it can counteract changes in pH to maintain 7.4. Chemically, a buffer consists of 1 or more pairs of chemical compounds to accomplish this. The buffer is blood is different from those within cells though their function is still the same i.e. maintain a certain pH. But in the process of counteracting pH changes, the buffer itself is chemically altered. This alteration has to be unmade eventually by the lungs and/or kidneys. Naturally, this compensation mechanism imposes a metabolic burden on these organs. Therefore, instead of saying that acidity is counteracted by any particular substance in the body, the kidneys and lungs have to work harder to remove acidity (and alkalinity). 1. Can ingested alkaline water actually enter the blood stream, then further into organs and cells to neutralise acidity? 2. If somehow, the alkalinity can enter our bodily systems (besides the digestive system), how do we prevent ourselves from overdosing on alkalinity? If we overdose, we too will impose a metabolic burden on our body to remove the excess alkalinity. Truly said proponents of alkaline water believe it works by making our bodies less acidic. I was searching for water filtration system San Antonio and got your blog. Hey nice blog, very well explain about the importance of baking soda in water. Does it really cure diseases ? I heard about the alkaline water is very much important for curing diseases and it's healthy to drink. Your Information was found useful for me.